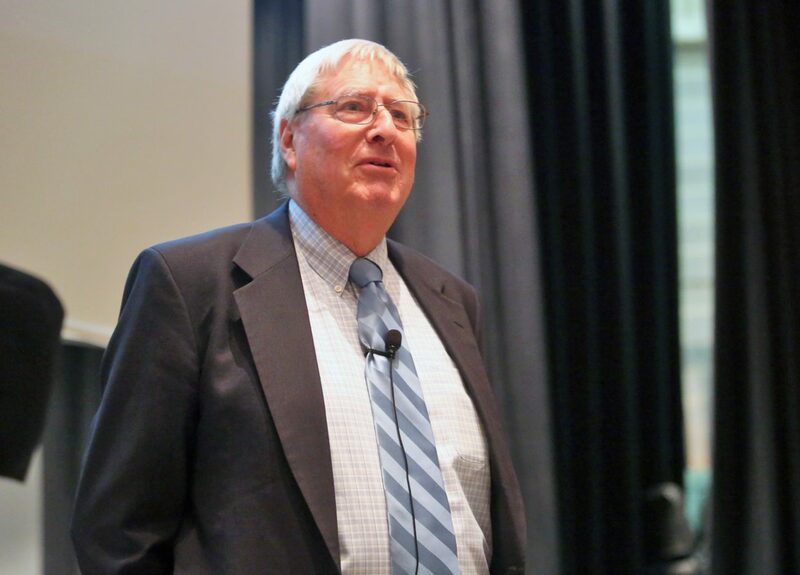 EDINBURG — A renowned Holocaust scholar, Christopher Browning was on-hand Thursday at the University of Texas Rio Grande Valley campus as part of the UTRGV Rondel Davidson Lecture Series. Having written extensively about the mass murder of Jews during World War II, Browning, a retired history professor formerly with the University of North Carolina at Chapel Hill, was instrumental in perhaps the most famed case of a Holocaust denier. In her book, “Denying the Holocaust,” historian Deborah Lipstadt accused historian David Irving of being a Holocaust denier. Irving once stated in Austria that Germans never used gas chambers to murder Jews during World War II, but sued Lipstadt for libel in 1996. Browning served as an expert witness during the trial and is credited with winning the case in defense of Lipstadt. The trial was made into the feature film, “Denial,” starring actress Rachel Weisz as Lipstadt in 2016. In Edinburg on Thursday, Browning focused his lecture on what he believes are similarities between the rise of fascism and Adolph Hitler in the years between World War I and World War II, and what he perceives to be an attack on American democracy today. Specifically, Browning warns of parallels regarding claims of returning to a “better past,” drawing on the public’s concern of political gridlock and economic failure, and making assertions that one man alone can solve a nation’s problems. He believes racism is also an important component, but makes concessions regarding the desires of power between then and now. In recent years, both Presidents Obama and Trump have incurred comparisons between their politics and Hitler’s. Browning’s lecture focused heavily on Trump, and he was also critical of the president in his book. “Today, President Trump seems intent on withdrawing the U.S. from the entire post–World War II structure of interlocking diplomatic, military and economic agreements and organizations that have preserved peace, stability and prosperity since 1945,” Browning wrote. But critics have also been vocal against such comparisons, and even that of Browning’s view of Nazi Germany and America’s current political climate. Some have said that the rise of Hitler and the resulting Holocaust are unique features of recent world history and not likely to be repeated. The seminar was well-attended with nearly 200 people in the audience, mostly UTRGV students. Samuel Zamora is a history major who has studied many of Browning’s written articles and books. He supports Browning’s argument that democracy is currently under attack. “I agree with the sentiment that there are a lot of people similarities; a lot of parallels overall. I believe in the concept,” said Zamora. Azucena Treviño also attended the lecture. She said she was there to learn more about Browning’s work and concepts as a historian. Browning is best known for his 1992 book, “Ordinary Men: Reserve Police Battalion 101 and the Final Solution in Poland.” He was elected a Fellow of the American Academy of Arts and Sciences in 2006. He retired from the University of North Carolina at Chapel Hill in 2014.